SOME INFRASTRUCTURE AND OPERATIONS AT MAJOR WEST COAST PORTS ARE STRAINED: The shipping industry is deploying larger vessels capable of delivering more cargo, but some port terminals lack big enough cranes, or other infrastructure, needed to handle these vessels. GAO: gaps exist in the information available to DOT about important aspects of supply chains. Movements of international trade between ports and domestic origins for exports and imports are not measured. DOT articulated the need for supply chain information in its draft National Freight Strategic Plan. The U.S. Department of Transportation’s (DOT) freight-related activities are increasingly multi-modal and inclusive of ports, but gaps exist in the information available to DOT and state and local governments about important aspects of supply chains. That was an important conclusion of a report released recently by the Government Accountability Office (GAO), a congressional watchdog agency. For example, the GAO report notes, a 2015 DOT report notes that movements of international trade between ports and domestic origins for exports and domestic destinations for imports are not measured. The report further states that this information could help DOT to assess international trade flows within the United States and strengthen the role of freight transportation in U.S. economic competitiveness. Federal guidance and leading practices in capital planning emphasize that good information is essential to sound decision making and achieving agency objectives. A few current DOT initiatives may help address some information gaps, but they are in the early stages. DOT has also articulated the need for supply chain information in its draft National Freight Strategic Plan, but does not outline how DOT will obtain this information or how it will be used. DOT is in the early stages of developing a written freight data strategy to improve the availability of national data on freight trends, among other things. “Broadening its freight data strategy to include supply chain information could help DOT to think more strategically about the specific supply chain information needed to support its freight efforts and advance national freight policy goals,” the report concludes. More and better supply-chain information could help DOT with its programs directed at U.S. West Coast ports, according to the GAO. Some infrastructure and operations at major West Coast ports are strained in the face of recent changes in global shipping. The shipping industry is deploying larger vessels capable of delivering more cargo, but some port terminals lack big enough cranes, or other infrastructure, needed to handle these vessels. 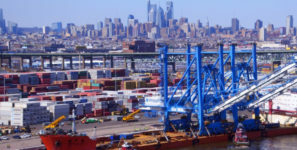 As part of the GAO study, port stakeholders told the agency that efforts to address constraints at ports are hampered by competing priorities and limited data. For example, most state and local government officials said that having information on ports’ performance and industry supply chains—the end-to-end process of producing and distributing a product or commodity from raw materials to the final customer—would be helpful to target efforts to address constraints at ports. The GAO recommended that, in developing a freight data strategy, DOT should identify what supply chain information is needed, potential sources of that information, data gaps, and how it intends to use this information to inform freight efforts.